He helped to serve them two portions of apple and mint ice cream. 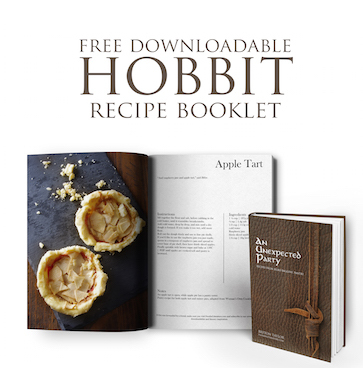 Taking part in RedwallAugust with other geeky food bloggers and anyone else who wants to join! I’d already made candied chestnuts and “Grayling à la Redwall”, so thought it a great chance to dive in and make another recipe from the first book of the Redwall series. Redwall was first published 30 years ago by Brian Jacques, after he wrote the stories for children he met at a school for the blind, while working as a milkman. The Redwall series now spans 22 books. His food inspiration, according to interviews, came from his childhood. He was 5 or 6 when World War II ended, and he recalled dreaming of lavish feasts in Victorian cookbooks his aunt owned during this period. Fortunately for us, he would later draw upon this as he wrote the Redwall series. 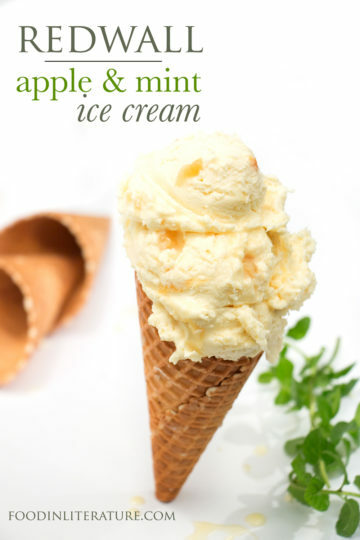 This apple and mint ice cream is just one of many delicious sounding foods from the first Redwall book. For this recipe, I wanted to try a condensed milk version. The simplest of ice cream bases, it’s a no-cook, no-eggs, “just mix”, type of recipe! In a saucepan, tear and crush the mint leaves, and mix over medium heat with the sugar and water. Bring to a simmer, then remove from heat to seep and cool. In a pan, heat the butter and sugar (splash in just a tablespoon of water if need be) and stir until the sugar dissolves. Add in the apples and let cook until starting to become transparent. While these are cooking, stir together the milk, thickened cream and condensed milk. When the apples are getting close to being cooked, pour in the juice from the pan into the milk/cream mixture, and stir. Place the pan back on the stove and sprinkle and stir in a little handful (~ ⅛ cup) of white sugar. Strain the mint syrup into the milk-cream mixture and stir. When the apples are cooked, browning and transparent, scoop those into the mixture. Pour into a metal container, and place in the freezer. Once the ice cream starts to freeze over a top layer, cover in cling wrap to keep smells from the freezer from seeping in.